UPDATE 1, 2 & 3 at bottom. "I want to speak on another thing that I heard two nights ago. It was odd thing to here, yet clear as day. In the spirit I heard, "Tell the Queen that in forty days, great change is coming to the UK." Now I know I don't have access to the Queen of England (LOL), but I understood that the change wasn't for the good. There's a great shift coming to that area, that will impact them in a major way; even their way of living." The release date for "INFERNO" in the USA is 28 Oct 2016... see my post here to see what date a little girl was given for the Chinese backing their currency with gold & massive chaos in America. This also reminds me of David Wilkersons warning of a European, North african or Eastern nation declaring bankruptcy, then a latin American country, then Mexico. 2 weeks from the first country going down, the storm hits the USA. Look at the countries first in line for release on Oct 13th then look at the USA 2 weeks later. The film first opens in Belgium on the 12th of Oct 2016 ( YOM KIPPUR / Hebrew Day of Atonement). Will Belgium be the first country to go bankrupt? Something to consider; Bilderberg 2016 held in Dresden Germany. Dresden was completely destroyed by allied fire bombing. I think we are being told without being told. My Daughter is 7 years old. She has an amazing gift at hearing Jesus speak to her. I’ve found children are very open to the spiritual world, more so then many adults. My wife and I ask her many questions to ask Jesus. Because of her inability to articulate what she says, we ask her questions with her to respond with a Yes/No or a date or a number ( In actuality these questions are directed at Jesus, she simply relays what Jesus says ). Most of the time she doesn’t even know what the question means. These are some of the questions and responses she gave me. Father: Will China give a big announcement in October of this year ? ( She then stopped and looked at me and said ” Jesus said it’s going to be very Bad ) When she said this it gave me the shivers. Daughter: Jesus said it’s going to be about Gold. Father: What will the date of this announcement be. Father: Will this be about China backing it’s currency with gold ? Father: Will the U.S. dollar collapse ? Father: Should I buy FAZ to make money from this collapse. Father: Should I buy options on FAZ. Father: Why shouldn’t I buy options. Daughter: Jesus said you will make more money from buying FAZ and not the options. Father: What price should I sell FAZ at. Father: What is the last month of could hold FAZ before selling it. Father: WHEN DOES GOD want me to sell FAZ. Father: What will the highest price FAZ will ever trade at ? Father: After I sell it what should I buy with it. Daughter: Jesus said a farm and silver. Note: my daughter said FAZ will trade at $100,000 at some point in time but God said for me to sell it at $10,000 in November. God knows the reasoning for this. Maybe when FAZ is trading at $100,000 in the future we could be in the middle of a Banking holiday or a Derivatives crisis where we could lose all of our profits. I won’t be greedy, I’m personally selling at $10,000 in November of this year. She also said an ounce of silver will be trading as low at $10 an ounce in November 2016 but it will skyrocket to over $750 early into the next year ( sorry I can’t remember the exact date, It might have been Jan or Feb ). I know this might sound very crazy to you because of her age but ask the Lord yourself if what she’s saying is correct. There are many other things she said such as paying James Bailey a 10% commission ( yes commission, not Tith ) on the profits from the FAZ because of his recommendation and also paying your God a 10% Tith. I plan on paying both as God his directed. As I mentioned she said many other things but I thought this would be the most helpful to people. https://www.youtube.com/watch?v=IWPNholTltY "Angels Demons, Fire and more"
A couple of weeks ago I was given what I call a "Daniel" type vision. I say this because most of the dreams and visions that Lord gives me are direct; without too much symbolism. But this was not the case with this one. So pray for wisdom and discernment, as I did, regarding what I'm about to share. It was about the fourth watch, and I went into a vision. In it, I saw three buildings. All three were made exactly the same, the only difference was their height. On the top floor of the shortest building sat Erdogan, and he was representing Turkey. On the top floor of the middle building sat Putin, representing Russia. The tallest building represented the United States, but there was no one seated at the top floor. There were people in the building; all US citizens, but no one was representing us. 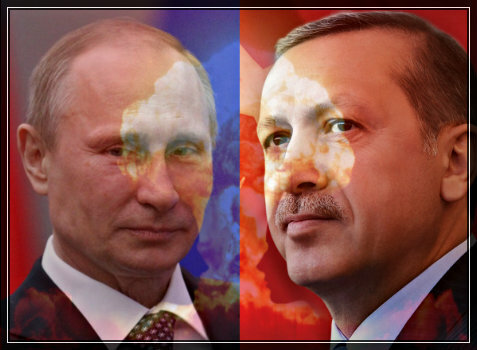 All of a sudden, there was an explosion in two of the buildings; the one for Turkey, and the one for Russia. The explosions happened at the top of the buildings. I wasn't aware of any casualties, but the buildings themselves sustained great damage. I then heard Putin and Erdogan talking. They were angry. It was then that I realized that we (the United States) were being blamed for the explosions. However, we weren't the cause of it. Next, Putin formed an alliance with Erdogan, and they called to other buildings to stand with them. I wasn't given the names of the people or countries in the other buildings. But it was only a couple more that joined in. Together, they began to make plans to bomb our building, and march in to take our people. If you don't already know, war world three has already begun. The media has just been covering it up with things like the Brexit, the elections, scandals, and reality TV. The fact is, Putin has recently made several threats, and then has moved on them. And in the process, he has warned the United States not to stand in his way. I also found out through research that Russia has rebuilt their alliance with Turkey after their recent failed coup. There have been many dreams, visions, and prophetic words from people like David Wilkerson and Dumitru Duduman, who have seen Russia invade the US. In October of last year (2015), the Lord showed me a map of Israel and Iran. He instructed me to begin to pray because Israel was going to strike Iran. He said, "War is about to begin." I asked the Lord, what war? And He responded with, "Gog and Magog." After this, I went through a period of three days of dreams where I saw war planes; bombers and fighter jets being launched in various places, including the United States. I also saw missiles being dropped on us. I want to speak on another thing that I heard two nights ago. It was odd thing to here, yet clear as day. In the spirit I heard, "Tell the Queen that in forty days, great change is coming to the UK." Now I know I don't have access to the Queen of England (LOL), but I understood that the change wasn't for the good. There's a great shift coming to that area, that will impact them in a major way; even their way of living. Stay Alert. Be Ready. Look Up! UPDATE 1: Does the INFERNO start in Belgium on the 12th of Oct? Is Belgium the first nation to go bankrupt? "Interesting news this week as Belgium-based Optima Bank has been shut down by both the National Bank of Belgium (which also acts as the Belgian regulating body) as well as the ECB. "During my early morning prayer time on August 28 2016, the Father spoke the following words to me. The Father shared with me that this event would be economic/financial in nature, but the cause could come from any direction, including natural disasters, terrorism, false flag events, riots, or just pick-your-poison type of event that is going to shock America. So it is a cause and effect scenario that leads to a type of shaking to our economy." UPDATE 3: Looks like a Bond selloff in the UK has begun, right around Mena's 40 day mark. So, the 60 day Heart Attack passed, as did Mena's 40 days UK major change, Murray, hasn't been heard of since. Why all the constant misses ? What's wrong ? All I can do is look at what has been prophesied and try to find common threads and connect the dots. Obviously I haven't connected the right dots. On why other prophetic words have not come to pass, I don't know. We know something huge is coming but what, where and when... that is a challenge. Destruction of New York City 26 Sept?